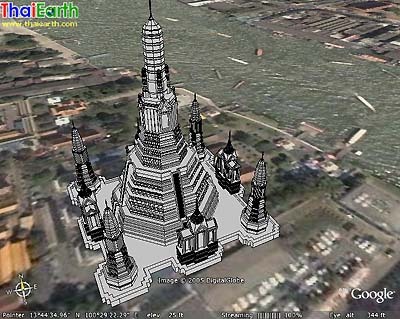 My website is the local community of GE users in Thailand. I send this mail to you because I want to promote one of my members’ 3D Model of Thai Temple to the GE user around the world. It’s one of our famous temple “Wat Arun”. I also attached the file with this mail. I think it’s very good example for the integration between east and west, culture and technology, especially on GE where the offline and online meet. Hope that you will excite when you see this kmz [988 KB] as same as I was.